Product Details: What a way to start the day! Bloody Marys have always been revered as a "hair of the dog" remedy. We've just added a kick to get your heart rate goin' and your mouth a burnin'. Made with one of the World's hottest pepper, the Ghost Pepper. Perfectly seasoned and easy to mix - just shake with tomato juice, vodka and ice. 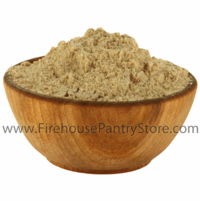 Fine powder consistency; shelf-stable; no refrigeration required. Ingredients: beef broth mix, seasoned salt, Worcestershire powder, horseradish, celery seed, black pepper, ghost pepper, smoked paprika. Contains wheat & soy. Packaged in a facility that also handles wheat, milk, soy, egg, sesame, peanuts, and tree nuts. Heat Level: 7/10 (Medium/Hot). Also available in a Mild Bloody Mary Mix. To make a Spicy Bloody Mary Seasoning Powder: Shake together 2 parts Scary Mary Mix with 1 part Tomato Powder (by weight). Adjust as desired.